Let’s Stretch Ourselves This Year and Set an IMPOSSIBLE GOAL! What’s an impossible goal? It’s something that you truly can’t ever fathom accomplishing this year. Let’s rewind to 2001. If someone had told me then, what I would accomplish in my pet sitting business, I never would have believed them. It would have been “impossible” for me even to consider. This is what I want you to do… Set a goal for yourself that you would never even believe is possible. Ask yourself, if failure wasn’t an option, what would I go for? Since your brain already thinks that the goal is impossible, it already thinks that you will fail, so now your brain doesn’t have anything to argue with you about. Fascinating, right? The brain is extraordinary! Who do you Need to Become to Accomplish Your Impossible Goal? Write down who you will need to become to accomplish it. Plan for some failures. It’s part of the process. Learn how to understand the benefits of failing. You never know where your failures might lead you. Here’s to an amazing year! You can do this! Today, our topic is SUCCESS, which is usually a taboo topic that people don’t like to talk about. Why? I’m not quite sure, but I definitely used to be one of those people. Well today, I’m going to talk about it, because there’s nothing to be ashamed of about being successful with your pet sitting business. 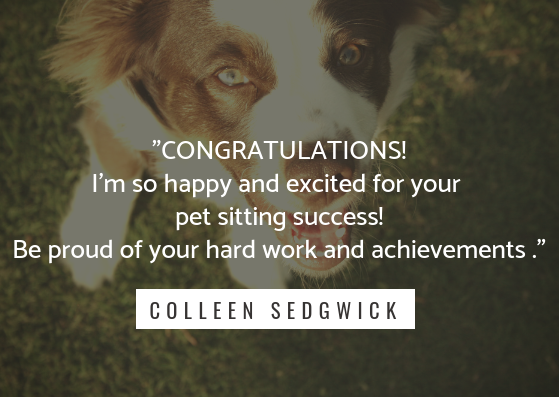 Having a successful and happy life is something that I am super proud of, and part of that success comes from my amazing pet sitting business. It has brought me so many blessings both financially and emotionally. It has taught me countless things about animals, people, life and business. 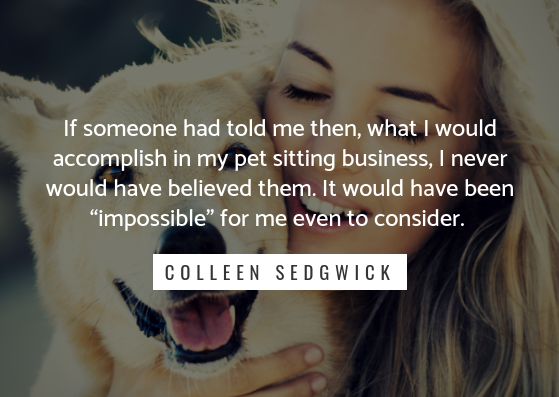 I’m here to tell you today that there’s nothing wrong with you achieving success through your pet sitting businesses, and don’t you dare let the haters dim your light and your dream. You know who I mean. Those solo pet sitting business owners who don’t want to grow a team and scale their businesses (totally fine, by the way!) Some of these haters will go around saying, “Oh, she’s just in it for the money,” or “They don’t care about the animals,” or “They must provide awful service.” This is backward thinking, and negative statements made by people with limiting beliefs, and I have no time for it anymore! Today I’m telling those people that they couldn’t be more incorrect! I can tell you from personal experience that nobody loves pets more than I do, but there came a time where I was unable to continue working the number of hours that I was working. Seven days a week, 365 days a year wasn’t a lifestyle that I wanted to lead. I was unhappy and exhausted, and by the end, I wasn’t giving the best pet care, because I was utterly burned out. Since I started focusing on the growth of my business and hiring heart-centered pet care professionals to join my dream team, my company has grown exponentially because they are out there providing amazing pet care and our customers rave about us and refer us all over town. I’m now also able to service many more pet owners in my community due to the excellent pet sitters on my staff. There is no shame in my game. I am proud of my pet sitting business. It affords me the time to be able to do the things that I love like paddle and tennis. It has also given me the opportunity to be a stay at home mom with my three children, Lucy, James, and Connor. It has given me the financial freedom to own a beautiful home and take vacations. My business has been a blessing! If this is something that you want, I challenge you to go for it! But you have to go and get it. It’s not just going to come and fall in your lap. It takes hard work and focus. You need to learn, and you need to implement, and you need to go grab your dream. Thoughts equal feelings which inspire your actions, which create your results. So my advice here for you today is to take massive action in your business. Get out there, start learning. Go for it. Grow it, if that’s what you want to do. There is no shame in it. And if you’re already out there killing it, don’t hang your head, don’t be embarrassed, and don’t let the haters out there make you feel poorly because you’ve created an awesome pet sitting business doing what you love and serving your community through your incredible business with an inspiring mission. Be proud, my friends. 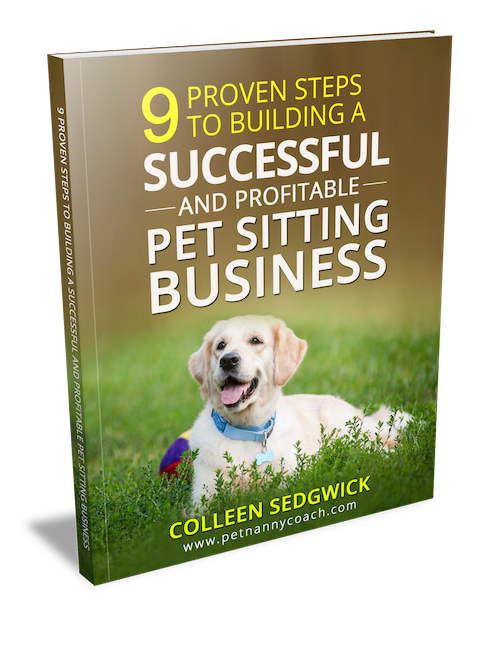 If you want to have a one-on-one personalized 10K Month Pet Sitting Blueprint Strategy Session with me, go to www.MeetWithColleen.com to apply. You will walk away with a personalized step-by-step framework anf action plan that I will email to you after our call.